Playing right now: the live disc of the 2002 edition of A Love Supreme. I'm thinking of drinking the Kool Aid on the new edition and getting it - bringing my number of copies of the original album up to four - because I got some nice Christmas money and because of the bonus sextet tracks. So it's the last day of the year. Where the hell have I been? Where has the time gone? Christmas Day would have been a perfect day to sit at the laptop and just blog away. But I think I gave myself the day off. No - I know I did. Also, the start of this week had a different assignment due each day: a feature for JazzTimes on Nate Wooley, a set of CD reviews for them and a piece for City Paper about the new CD-EP by City Steps. I spent what little free time I had listening to those CDs, transcribing my talk with Nate, eating, working (I got a lot of hours last week), getting a little under the weather, trying to roll with it and then travelling out of town. One of the musical highlights since the last post was seeing the "ChrisParkermas" show at the Thunderbird during the weekly Space Exchange series on Tuesday. That night gets its name from the fact that guitarist Chris Parker (a curator emeritus of the series) was born on Christmas Day. Years ago, bassist Paul Thompson did a spot-on Bob Dorough imitation in "Nothing Like You," during a night of Miles Davis music. Each year I think it'd be great if he did the Dorough/Miles holiday song "Blue Xmas (To Whom It May Concern" but I never think to suggest it until it's too late. This year, I suggested it early enough and Paul sang it with the band at ChrisParkerMas. I don't know about anyone else, but I thought it was hilarious. Plus, that song has a number of tricky stops and tempo shifts, which the band figured out and played perfectly. The rest of the evening featured other holiday fare and Chris also had great arrangements for a bunch of chestnuts, including "Sleigh Ride" (one of my faves) and "Little Drummer Boy," (not one of my faves but it sounded awesome that night, due in no small part to Dave Throckmorton). Tomorrow, my head willing, I think I'll get up and do quick posts about a few albums that might have flown under the radar and didn't make any Best-of lists. In the meantime, if you want to see my list of favorite jazz albums of the past year, check out the NPR jazz critic list here. There's a spot for individual lists too if you scroll down and follow a link. "Illumination" kicked off the evening and proved this was no ordinary show. The stop-start theme of the song sounded tense and edgy with the whole band playing it rigidly. It created suspense, waiting for the rhythm to kick in. When it did, Harper was ready to put off some heat. Trumpeter Freddie Hendrix did the same, playing a call and response with himself during a solo. Unfortunately the sound mix preferred Aaron Scott's cymbals over the piano of Harper's longtime bandmate Francesca Tanksley, so the wild accents overshadowed a lot of her playing. It took a few songs for the balance to be reached. Alto saxophonist Jaleel Shaw didn't fare as well. His solos could be heard for the most part, but it was hard to really feel them throughout the evening. But magically, the so-so mix didn't diminish the impact of the sextet's performance. Harper spoke during our interview about the healing power of music, and while I might not have been in need of healing per se, there was definitely a moving quality to the band. "This is what happens when you have a good audience," Harper said. Some of the tunes are things he's recorded and returned to on a few albums, but they all felt new that night: the massive "Thy Will Be Done," which closed the first set; "Africa Revisited," the groove-heavy piece that featured poetry by Amiri Baraka when it was released a few years ago on Blueprints of Jazz; and "Harper's Funny Val" (at least that's what it sounded like he called it) took the old warhorse "My Funny Valentine," slowed it down and made it more spiritual. These were just a few of the high points. 30 years ago, the Shadyside Balcony - a landmark on Walnut Street during the '80s and '90s as an eatery and a place to hear jazz - presented a concert series that included shows by the World Saxophone Quartet, James "Blood" Ulmer and Archie Shepp. I was there for those shows because my brother worked at the Balcony, and its sister restaurant Hot Licks, which was located downstairs. I didn't know until last Saturday that the first of these performances (which were produced by a production company called Kokopelli) was none other than Billy Harper, who was touring as Black Saint at the time. That was the name of one of his albums, which was the first record released by the Italian label Black Saint. The picture on the label of all their records is Billy Harper, by the way. I wish I had been at that show back then and I can't understand how it flew under my radar. Who knows what kind of impact his set might have had on me then? Nevertheless I did see him last week and for that I'm glad. 2015 has been a fruitful year for the Intakt label. While the CD industry is considered dead in this country, this Swiss label has cranked out a number of releases this year, all valuing artistic statement over commercial potential. Piano/drums duo performances by Marilyn Crispell & Gerry Hemingway and Irene Schweizer & Han Bennink; the duo of Mary Halvorson and Stephan Crump (known as Secret Keeper); as well as a blistering free improv romp by Katharina Weber (piano) Fred Frith (guitar) and Fredy Studer (drums): these are just some of the discs that washed up on our shores. This egalitarian layout reflects the music, which comes from a totally improvised performance at the Cornelia Street Cafe in New York. No one calls the shots. 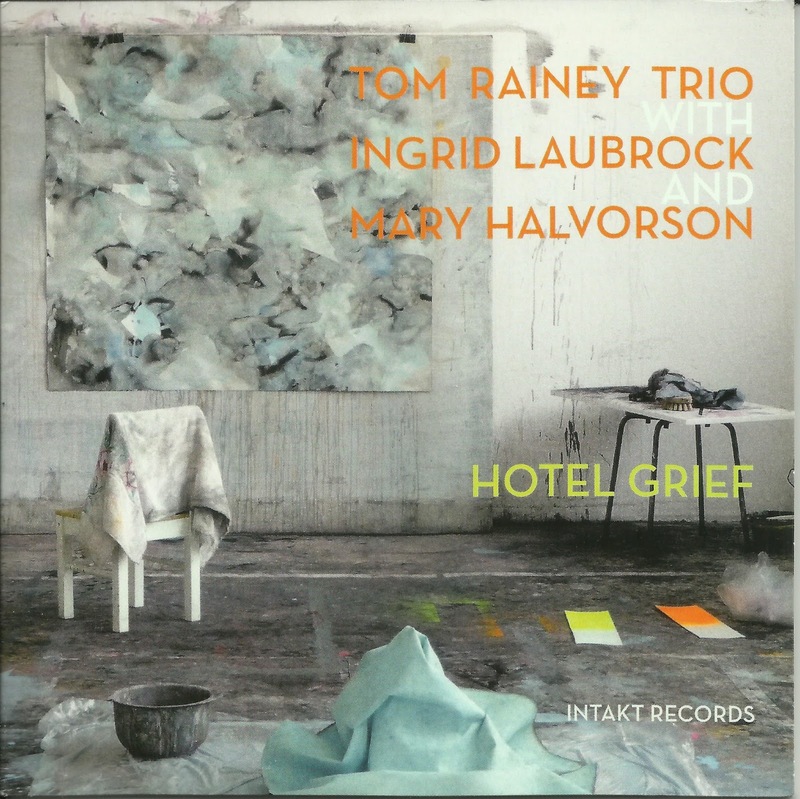 One improvised section morphs into another, with Rainey's drums alternately providing shape to Laubrock's tenor lines or attempting to chop them up. Halvorson strums some mangled clusters of notes, or plucks away as her instrument sounds like it's melting. During one section of "Proud Achievements in Botany" she strums passionately and suddenly turns the volume pedal down, so all that's heard is the unamplified sound of plectrum on strings, captured by ambient mics. Although this is definitely free music, in terms of meter and melody, the comfort level and understanding between these three players makes the album sound as if at least some of it could have been composed or predetermined in some way. Three of the five tracks last between 13 and 18 minutes, which allows them all plenty of time to explore the space (and giving Laubrock the chance to switch to soprano sax on one of them). There are moments on the album that resemble a Tim Berne session, where one musician starts on a different path while the rest of the band backs away at first, allowing the piece to take on a different shape or sound. The musicians are highly engaged in conversation on this album and it's easy to feel that from the listener's standpoint. 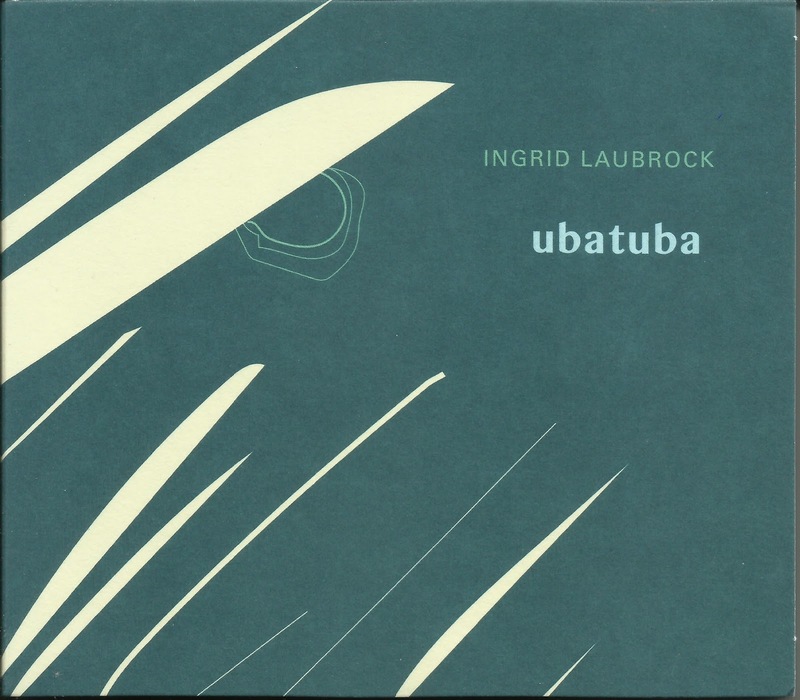 Ubatuba features Laubrock (this time playing alto as well as tenor) and Rainey, together with Tim Berne (alto), Ben Gerstein (trombone) and Dan Peck (tuba). When Laubrock composed the material for the session, she wrote on the saxophone rather than the piano. This approach lends a starkness to some of the music, creating suspense as sounds layer over one another. "Any Breathing Organism" opens the album with the horns blowing low, long tones ever so softly, the sound of air nearly taking on as much significance as the clashes of notes. In the second half of the piece, Berne adds an animated solo to the backdrop but it never moves beyond the slow drone, so the suspense isn't completely dispelled. The next track, "Homo Diluvi," begins with the horns playing warmer harmonies. The melody of this one moves in parallel lines, though the voicings stay pretty edgy and tense. After a wild alto solo, the track climaxes with a wall of high, shrill notes. This blast is nothing compared to the opening of "Any Many," in which each player coaxes the most rabid sounds out of their instrument, from somewhat flatulent tuba pops to saxophone growls. Laubrock, however, has more in mind that just the abrasives. Before the track ends, the quintet has dabbled in a more focused group improvisation and then a set of countermelodies that spill over one another and still maintain focus. All this, from one of Ubatuba's shorter tracks. Laubrock uses silence or open space in many of these tracks, which on the first few listens can be off-putting. "Any Breathing Organism" and "Any Many" have pregnant pauses galore. Then the final track "Hypnic Jerk" [sic] in fact sounds very much like it's over after seven minutes, when it's actually just reached the midway point. 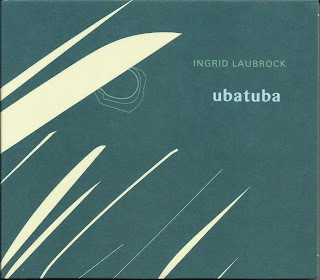 Laubrock begins with a pointed an alto solo backed by tuba and drums that gradually bring in the rest of the band. Berne offers another solo, then things pull back, as Gerstein and Peck play softly off in the distance while Rainey taps on his rims and cymbals. The dynamics rise back up, but things end with a twist: a fade-out on the drums. Ubatuba at times recalls the idiosyncratic compositions on some Art Ensemble of Chicago albums. (The opening track especially evokes Roscoe Mitchell's "Tnoona.") But the similarity seems more coincidental or it works more like a quick acknowledgement as she heads down her own path. While parts of the album don't come off as strongly, as a whole, she has created an interesting work with a strong band to elevate it. 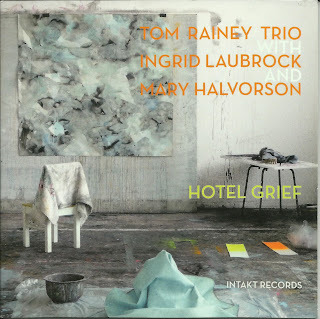 Also, her own solo on "Hiccups," backed only by Rainey, stands as one of the highlights and an example of the vision and energy from Hotel Grief working its way into a composed set. My entire interview with John Lydon, complete with the sound effects (in parenthesis, of course) just went up on Blurt's website this week. You can find it here, along with some words about the Pittsburgh show, and some links to videos.